Today is Tuesday. Today, it is cold in my house. Today, I was reminded not nearly as cold for me as it is for people who have nowhere to live. So, while I was whining how cold I felt, I recided to do something that would help others and warm my heart. 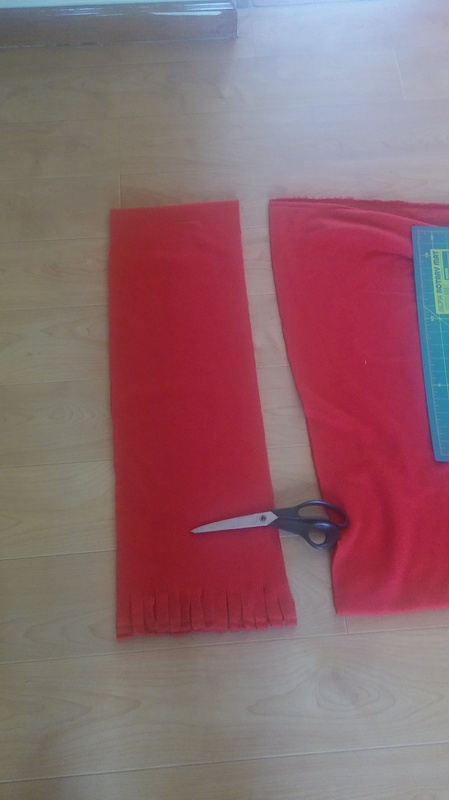 I found some red fleece and began cutting out scarves. I like the fleece because it’s warm even though thin. I can roll my scarves up tightly to fit in my bags I hand out. Today, I got a call from Matt checking on the progress of when we might get our electricity back. It’s not looking real good for anytime soon. Several trees are laying on top of the lines and each other. Today, I got to work making scarves and rolling them to go in bags. When you are making your bags ( was that subtle enough?😉) remember hats, mittens, socks and make some scarves. Winter is coming and we need to pull together and take care of each other. Today is Monday. Last night Jose blew through uprooting trees and taking down power lines. Tonight Paul and I had peanut butter and jelly sandwiches by candle light. Our power lines were torn from the house. 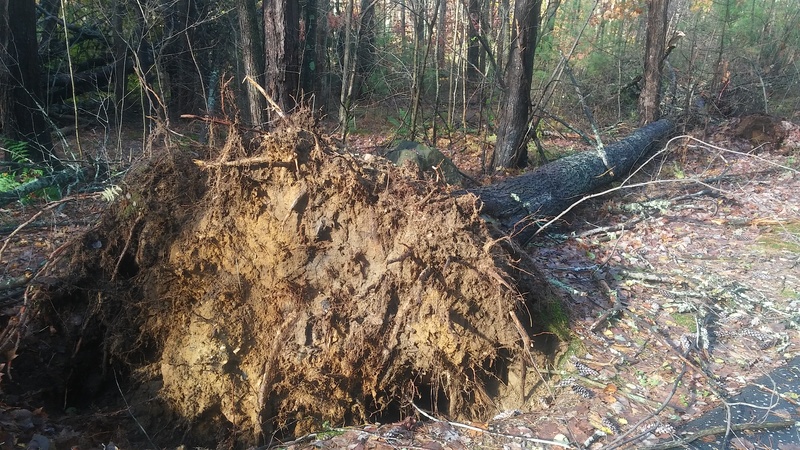 We are thankful because the 8 trees that were uprooted fell oddly away from the house. Matt called. He had already had a premonition on Saturday and warned us to be careful. I have to save battery power. Today is Sunday. Today, tropical storm Jose is supposed to descend on New England bringing lots of rain and high winds. I was thinking about how many times I have heard people say the winds of change are upon us. You can stand against it and try hard to resist or you can slip into the stream and go with it. Either way, it’s going to happen. Some winds are sweet and refreshing, others, not hardly. When the strong blustery winds come through threatening to wreak havoc. They may seemingly undo all the work that people have worked so hard to put in place. It is discouraging and incredibly frustrating but we can’t expend all of our energy on the rant. We have to pick up the pieces and move forward. We will be the zephyrs of change. I spoke with a very dear woman who is native. She was torn up inside by the fact that one of her Elders, a man of great integrity, compassion and a staunch fighter for his people is making his final journey home. She mentioned how she wanted to be like him. She is already like him. She stands against the foul winds of change and speaks passionately for her people’s rights and the rights of all. She may not think herself eloquent or a pillar of strength; but she gives me courage. She inspires me. She is a mess health wise, but that does not stop this incredible woman. You are a heroine to me, Rachel. Blessings and peace to you, lady. Love is the soft breeze that tugs at our hair, caresses our skin, carries the scent of fragrant flowers. It makes our hearts survive life’s pain as we share with others. Much much love my friends. Today is Saturday. Today, the day was one of those you would keep tucked away in your memory for a long time. The temperature was chilly enough not to wear short sleeves but the sun was warm and bright. Nearly 70 percent of the trees have changed colour. I went for a walk with Paul in this cool little village called Canterbury. Have you ever watched a hawk just glide overhead. That is what I wanted to do today. I wanted to grow wings and just glide overhead. But, since I have only arms and legs, I walked up and down hills, through meadows and near lakes. Matt is like a sponge just soaking up everything we describe to him. He is so happy that we are in a place that has such beauty. It is like medicine to a wounded heart. Today, I am continually grateful. Most people in the world don’t have much of anything. Their lives are very difficult. Many suffer tremendously. Of course, my family has not been on a picnic for the last 9 years; nevertheless, we have been blessed in spite of some really evil people and systems. I hope you have a memory or two that is medicine for your heart. Create a special memory for someone you know who is struggling. Today is Friday. 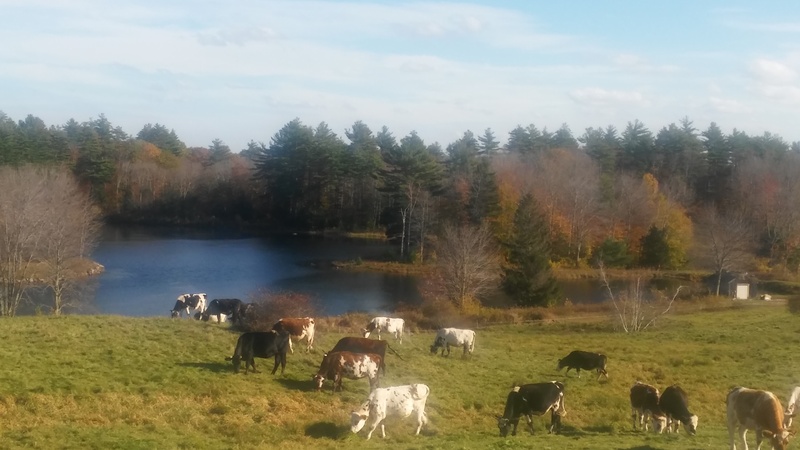 Today, the sun shone after several days of cloud cover and rain. It was so bright that it was almost blinding. Light, even a small amount, can do that if you’ve been in the dark for a period of time. The question is why would you choose to remain in the dark if light was available to you? Why would you ever pass up the possibility of being illuminated? Some say knowledge is power. Obviously, it is not without risk to change. What about truth?. Many times it is painful but is it not better to know the truth so you can make responsible decisions? So, you can make decisions not based on lies? Truth seekers will eventually become truthtellers. I have a brilliant friend who is like a walking history book. She can trace events, people, and movements and put them into context for why patterns of behaviour are perpetuated. We spoke today about how many people don’t think for themselves. How they are willing to accept claims, traditions, notions without investigating. How many don’t understand their own histories never mind the world at large. They are just echo chambers of someone else’s ideas and most times those ideas can be dangerous and full of error. Some one who I thought knew me better made a comment that my son hides behind a mask. My son doesn’t hide. My son chose to be anonymous. My son chose to encourage people to think for themselves. It’s not about ego. It’s not about following a person or persons, it’s about allying yourself with those who have the same ideals as you do. It’s that everyone matters and not just a select few. It’s human nature to want accolades and fame; it is another thing when people choose to do good on behalf of others whether they are acknowledged or not. They do it because that is who they are. That my friends shows great character. There are so many I am privileged to know who are just those kind of people. Today is Thursday. Today, I must say that I get weary very quickly of the same old political statements people make. They forget about human beings and deflect to some grandiose conspiracy like immigrants are destroying the country. Once I hear the familiar rhetoric, then my patience evaporates and I kindly dismiss them. I won’t apologize for feeling compassion and frustration over a 10 year old Mexican girl who was promptly snatched up after a surgery to be hauled off to a detention center. She’s been living in the country for 10 years, her entire short life. It just boggles my mind how some folks can justify this happening to a little girl. Just a little girl. Tonight, I don’t want to end on a sour note. I watched the rain come down most of the day. I have a really lovely view out a window of a small bedroom that I have turned into my art room. I appreciate the soundtrack to Lord of the Rings and the Hobbit. I usually listen to music like that and get creative. I hope my peeps are encouraged by what I send them. Something you love should be shared and I love art. I love to bake, too, alas, I can’t send out cookies or cakes. Matt called tonight in a better mood. He was bummed out last night. It’s tough when the holidays are coming up. I think about all those in prison and their loved ones. Today is Wednesday. Today, I spent some time painting and making projects for some who are very near and dear to my heart. If I promised to send you something, trust me, I am working on it. Sometimes money and time become an issue for me. I have not forgotten. Today, I made a trip out to the post office. I ended up at the long light again just before turning under an overpass. There stood an older man off to my left with the familiar brown cardboard sign indicating that he was homeless. Sometimes, I get it right. I had made up another bag right after giving one out to a young woman some weeks ago. This one was sitting on the front passenger seat of my car. So, I was able to just roll down the window and hand it to him. Praying; makes me think of the dude who tweeted out that Paul and I were somehow deluded by our son because we are religious. That’s priceless. Yup, we are Veterans who held top security clearances, with master’s degrees, and research skills that would put most legal aides to shame and yes, we are Christians and we pray. By the way, all three of us do have integrity and about being deluded: NO. The only people deluded here are those who trust their government to tell the truth. (Thank you Barrett Brown for stepping up on Matt’s behalf). Do something cool. 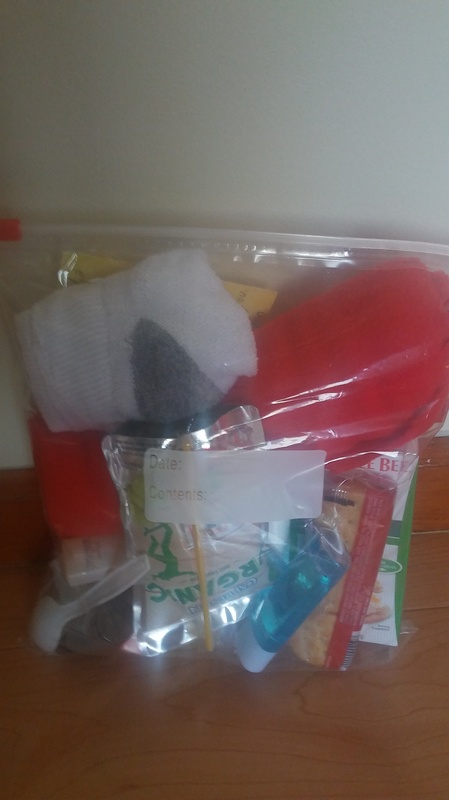 Go fill up some bags and don’t forget the mittens and socks for those who need some kindness. It’s a very rough world out there.